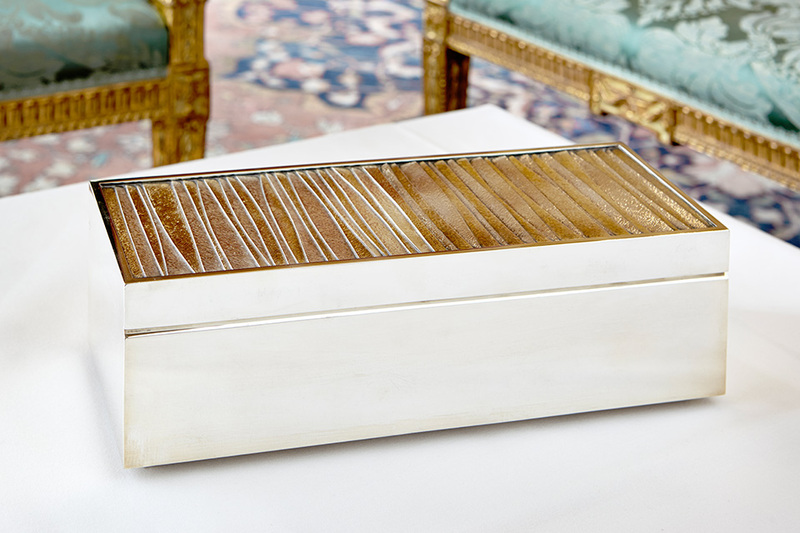 Of oblong casket form, the cover with flush hinge and with angular panels of contrasting silver and silver-gilt strips, each engraved with a herringbone pattern, the interior lined in English yew. Antique Collectors’ Club, Woodbridge, 2015, p. 405. Keith Redfern was born in Sheffield and trained at Sheffield College of Art and then at The Royal College of Art under Professor Robert Goodden. Early association with David Mellor, Walker and Hall and Elkington were formative experiences influencing his early design work. In 1963, together with two Royal College graduates, Keith Redfern established a design and manufacturing company trading as Silver Workshops Limited. This lasted until forming his own practice, Keith Redfern Designs, in the early ’70s. His output as a designer and silversmith has run parallel with work in higher education. Until his retirement in 1990, Keith Redfern was Head of School of Product Design at the University of Middlesex, here and at the Hornsey College of Art he established courses of international status and reputation in silversmithing and jewellery. His many commissions are housed in major collections here and abroad, including The Royal Yacht Britannia, Government of Dominica, Pembroke College, Cambridge and City Livery Companies. Recent pieces have been commissioned by the Haberdashers’, Drapers’ and Goldsmiths’ Companies, Lichfield Cathedral, Freshfields and the Middle Temple. Keith Redfern has exhibited widely both in the United Kingdom and abroad. Recent exhibitions include; ‘British Goldsmiths of Today’, Goldsmiths’ Hall, 1992, ‘Creation’ at Claridges, 1994, ‘Living with Silver’ at Asprey, London and New York, 1997 and ‘Silver and Tea – a Perfect Blend’ at the Goldsmiths’ Hall, 1998.